This product is Demo. Enjoy the style and features of an executive phone in thecomfort of your small/home office. 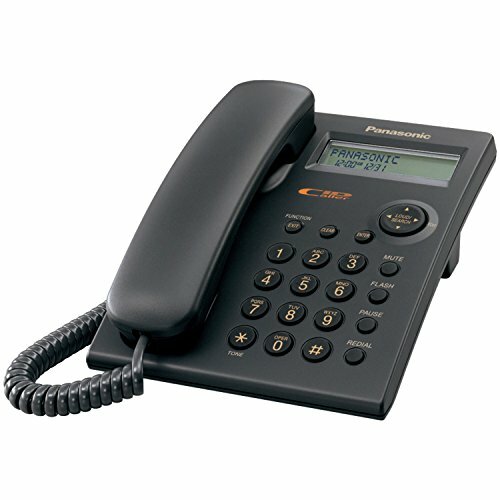 This luxury telephone has 4-lines, each withdistinctive rings and line-in use indicators. Plus it is expandable to 16separate stations for added versatility. You'll be spoiled by the convenience ofa full performance speakerphone with hands-free dialing and auto-transfer to thehandset. With this feature you have the versatility of dialing out of memory orby using the keypad without even picking up the handset. Call-Waiting Caller ID*displays the name and/or number of the person calling, even if you're on thephone with another caller. For even more versatility, we have included a dataport for fax, modem, or an answerer with the appropriate line selection. This product is Demo and comes with a 90 day warranty. It's great when they get it right! 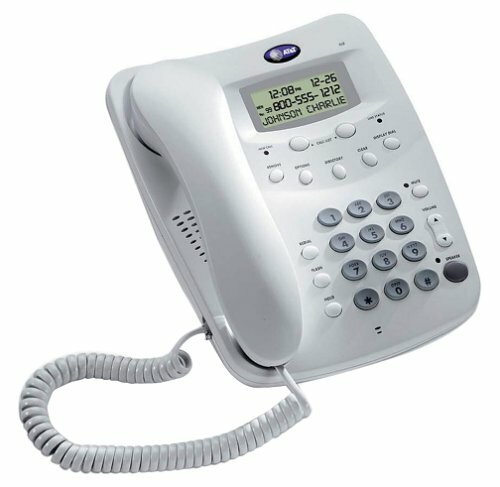 I've been looking for a high-quality multi-line office phone for several months, and have had a few bad experiences. It seemed that I got what I paid for, which was low-price, low-quality, and I just couldn't find a good solution for less than several hundred (or thousand)dollars. My criteria for selection (in no particular order) were: 1) 2 to 4 line support, 2) Speed dial buttons, 3) Caller ID/Call Waiting ID, 4) Headset support, 5) Adjustable volume for receiver (ability to make the caller sound louder), 6) Expandable (support for extensions that work together with each other), 7) Intercom between extensions, 8) Call Transfer, 9) Conference calling, 10) Speakerphone, 11) Line priority (which line is selected when you pick up to make a call). 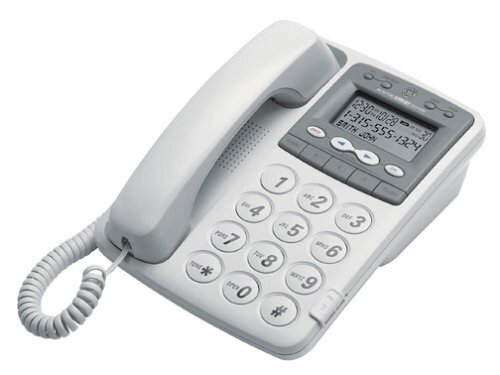 The GE 29488GE2 Corded Phone not only includes all of these features, but even more than I could have expected. My biggest pet peeve about phones is when you can't hear your caller, and you have no way to adjust the volume. 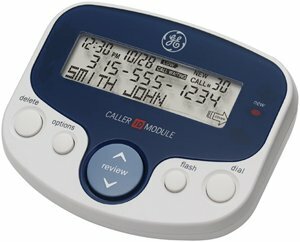 With the GE phone, you just touch the Volume Up button while you're on the call, and the volume is increased. This isn't a "fake" or "placebo" feature. The voice of the caller is actually amplified, and you can increase it to levels that border on uncomfortably loud. The multi-line support (this one supports 4 lines), is integrated perfectly into the phone, and functions exactly as you might expect (definitely how I would expect). When the phone rings, you just pick up the handset, hit the Speaker button, or hit the Headset button (if you have a headset) to answer. You don't have to press the ringing line button first. Likewise, to make a call, you just pick up the handset, and an open line is selected. The Line Priority feature lets you set which line is automatically selected when you take the phone off the hook to make a call. This is very helpful to me, because I have the phone programmed to select my second line, rather than using my first line for outgoing calls. The phone has 16 speed dial/intercom buttons. Programming is a snap using the 4-line backlit LCD display. Each button can hold a dialed number and double as an intercom number. You can even program a button to use the numbers stored in other buttons to make calls. This is very handy when you have a calling card and need to dial several numbers before/after the actual number. You can program in your calling card and access numbers once into a button or two, and then reference those buttons in the dialing sequence you program into the remaining buttons. Even the length of pauses can be programmed. The Caller ID display has a very interesting feature that lets you program the phone not to save any "Unknown" or "Blocked" caller information in the Caller ID history. When you plug in a GE 29488GE2 phone, it immediately starts looking for other phones on your lines. Each phone can be identified by a programmable name and a station number, up to 16 phones. Each of the 4 lines can be set with independent ringing options, such as volume, tone and whether or not Caller ID information will be displayed for that line. You can also program the phone to automatically answer and go into Speakerphone mode when it is called via the intercom from another phone. The phone is powered by an A/C adapter, but also has a battery compartment for 3 AA batteries for Caller ID backup. It also has a data jack on the back that you can plug your fax or answering machine into, along with a switch that lets you select which of the 4 lines the device will access. All-in-all, this phone has the most features and functionality for the price. Its functionality is very well integrated and it operates predictably. It is easy to program. My only negative comments are: 1) It comes with two 2-line phone cords, but not any adapters to merge two separate lines into one cord. If you have two separate phone jacks on the wall, you'll need a 2-to-1 coupler for each set of 2 lines. 2) The instruction manual says you can only use one specific brand and model of headset, which you must order by phone from one vendor. This isn't terrible, though, because the headset is about $30 with shipping, but you should be prepared for this extra expense if you want a headset for the phone. 3) The manual gives great step-by-step programming and use instructions, but could spend a little more time explaining the features and what they may be used for. I've tried numerous multi-line cordless phones, too, and none of them had the features, functionality or quality of this corded phone. At this price, I can afford to have several of them spread throughout my office, and I don't need to worry about fussing with a cordless and all of its related problems. This phone has some weight to it, too, so you feel like you're getting a quality product. Bottom line is if you need or want a phone with these features, this is the phone for you. Found all funtions of the phone to work ok. All volume levels were great and could be adjusted for headset, handset, and speaker. Design is great though display is a bit hard to see if phone is not propped up in the rear. The big disappointment is when putting a call on hold. My customer advised be that while on hold there is some type of ringing sound and the customer hears. This was a pain when I needed to put a 20 person conference call on hold. Everyone on the call heard the tones. My old IBM and my AT&T multiline phone don't have this problem. I purchased the Panasonic Phone # KX-TS282B based on the only 2 reviews I could find, which took several hours to find. Trying to find a site where you can find or leave a review for a Panasonic phone is a joke. As one of only 2 other reviewers stated, "It is a PITA!" Yes, it is a nice looking phone and yes it has lots of features, however, I was disappointed that it did not have an internal answering machine. My inexpensive GE cordless phone for my residence has that and it has always worked great.I can't imagine a business phone that doesn't come with answering phone or voice mail feature. I have just purchased a franchise, which I will be doing as a home-based business for the first year.I am it.I need a phone that allows me to connect with my customers when I am away from my office and visa versa.If a customer calls me and wants to leave me an order or wants to inquire about prices or products and I am out on a delivery, that customer cannot leave that information and time is wasted playing phone tag trying to reconnect with that person. I certainly can't afford to lose customers before I even get them. I will take part of the blame, because I shouldn't have assumed that it had that feature. Also, a little flyer was in the packaging that stated, IMPORTANT! Before you return product to the retailer! Call us FIRST at 1-800-211-7262.Supposedly their hours on Saturday-Sunday are from 9am-7pm EST.Well, I live in the EST time zone and I started calling at 4pm on Saturday and 2 hrs. later I gave up. All I got was a busy signal.Do they only have one phone line? What a PITA trying to find reviews for 2-line landline phones. Using it for a home office phone. NICE: Crystal clear. Speakerphone is very good. CallerID is great and allows easy addition to built-in directory. Can use different ringtones for each line. Can add other phone of same type as extensions with intercom capability. Has jack for headset (haven't tried it yet). Has Mute button for those boring teleconference calls. It has Caller ID and if you have the service, Call Waiting ID. It has a 14 number quick dial, and a 25 number stored directory dial. You can store numbers from the Caller ID right into quick dial or the directory. You can redial numbers directly from the caller ID screen with the push of one button. It has a speakerphone, with mute, and volume control for the speaker phone. It has a hold button. All of the buttons are large enough that you don't feel like you're pecking at microdots. It is easily wall or desk mounted. The LCD screen is very visible, and can be adjusted for contrast. You have a choice of English, Spanish or French for the language. You can program in area codes if you have to always dial 10 numbers to make a call (I think this is called layering or somesuch by the phone companies). All in all, a lot of quality for a very reasonable price. Audio quality seems good, and I am a little hard of hearing in one ear, but there is no problem with this phone in that regard. It does require 4 AA batteries which are not included, but to be honest the batteries that get included with items are garbage anyway so you'd want to use quality batteries. 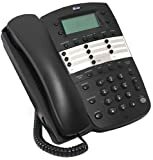 If you need a corded phone, which you should have in the event of a power failure (your cordless phones will not work without AC power but phones plugged into a regular phone wall jack will work if the wires are not down), then this is going to be the phone for you. Siemens - Do you even care ? Had a Gigaset 2420 - very expensive, worked great for about 2 yrs - then like everyone else that bought one experienced bad display and warbling when on calls. 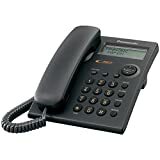 Looked for replacements and found the Gigaset 8825 had the best feature set for the money -bought into Siemens again for even more $$$$The phone out of the box had clicks and pops in the cordless conversations - then lately ( 1.5 yrs old ) the caller ID on line one no longer works. Sad - Very Sad I have to see if I bought this on one of those credit cards that automatically extends wty - Siemens does not want anything to do with it - their 800# support only helps their newest prey - the tech I reached on their toll # only said the phone was shot and bring it to a service center.Collectively people have lost a lot of money to this company.I for one will not buy any Siemens product again - ever. From my experience, Siemens never repaired the issues form their first miserable attempt at creating a consumer/home office phone line of business.I made this mistake of forgiving them on the first iteration, only to see the same problems on the second. If you have the same experience as I, you'll begin to see the LCD fade after a year, maybe two. The handsets deteriorate in short order as well.For me, attempts to contact Siemens result in an offer from them to sell me reconditioned components, or no return e-mail at all. If you buy this you will be: wasting your money, rewarding gross incompetence, become as frustrated as I. Stay away from Siemens phones! Pros:Specifications look good on paper.Phone made neat crackling sounds as I used it for target practice with my shotgun. This system reminds me of Paris Hilton - nice package that works out great for a while, but sooner or later you discover there is little merit to this overpriced, high-maintenance, fragile and fickle unit. Customer service is basically from the "we-already-made-our-money-and-we-don't-repair-them-so-screw-you" school of thought.Unfortunately, I bought 2 of them with 4 remotes.Both base stations have failed - so I guess I'm stuck. I had the previous line of phones and paid hundreds of dollars for it only to find that a power outage destroyed line 1. Siemens wouldn't fix it and essentially told me I was out of luck.I swore never to buy another Siemen's product.I was curious about the new generation phones and I see that they still have the identical problem.It doesn't surprise me.They showed zero interest when I reported the problem so how could they redesign the next generation of phones to deal with it. Good range, excellent sound quality, loaded with features.In the Fisk Mansion we needed a way to have a bunch of phones without ripping out the walls and this worked great for us. Hard to get to line 2 from remote handsets. SpeakerPhone is not loud enough. 1. Remote operation: You cannot use a cell phone to check messages remotely on this phone (Southwest Bell Help Line) making this service useless for most operators. 2. Limited technical help - required four days to have phone call returned. 3. Poor sound quality on the digital message system. 4. Garbled instructional messages built into the machine which cannot be turned off. It works, and it takes messages, but I expected more. 1) You need the manual to use this one - nothing is intuitive. i.e. There are TWO buttons labeled erase, and they only work in certain modes. huh? 2) To set the time, you cannot use the key pad, you have to use the review side switch to go through minute-by-minute with the annoying/scary son of Dek Talk voice saying every minute... by the time it says minute FORteeFIVE I wished I had waited until 1 AM to set it. 3) It has to tell you the instructions verbally every time you use it - I couldn't figure out how to turn the annoying voice off. 5) Even with all the audio information it does not have a beep function to signal new messages. very nice multi-function corded telephone.great price. We bought this phone to replace a cordless phone that kept getting intermittent interference.It works great with no interference.We replaced the short cord that came with it with a 25 foot cord.We still don't have the freedom of a cordless, but we don't have the static either. If you're on the lookout for fabulous stereo sound and a lot of bells and whistles, this unit probably isn't for you.However, if you want an easy-to-use clock-radio-cd-telephone combination that saves some space on your nightstand, this works quite well. The sound from the radio and cd player tends to reflect the speakers being rather small, but is decent enough for what I expected.The controls are easy to use, although a couple of CD controls may be worth reading the instructions for (such as, if you want to skip ahead to another track on a CD, press the "CD display" button before you press the forward button, or you'll just fast forward through the current song).There is a night light on this unit that is actually quite helpful, if you don't like turning on your lamp and blinding yourself when you just need something to keep you from stubbing your toes on the way to the bathroom.The button to turn it on and off is large, so you aren't fumbling in the dark for it.Same goes for the snooze button in the morning - I like being able to groggily thwack a button that's easy to find.The clock display is bright and easy to read (I replaced an old Timex unit whose Indiglo light didn't "glo" nearly enough).I don't think there's a "dim" setting for the clock, so keep that in mind if bright displays bother you at night.The volume and radio station tuning controls are a little fiddly, being on the side of the unit rather than the front, but are still better than some I've used in the past.The phone handset is pretty straightforward, the one drawback being that when hanging up you feel you have to make sure it "sits right" in the cradle, so you really know you've closed the connection.And, as always, Caller ID is a "Good Thing." Overall, I've found this unit to perform well for the purposes that I bought it for, and have been quite pleased. Panasonic's KX-TS3282W two-line integrated cordless phone system offers a convenient solution to small-office telephone needs. 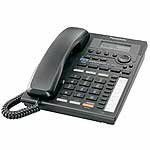 With its flexible extension numbering, built in data port, and included four-wire phone cord (two-wire cord also included), the KX-TS3282W also houses convenient business features, such as three-way conferencing, speakerphone capability, and support for an optional headset. It can expand as your needs grow, up to eight stations. This model supports caller ID with call waiting (with subscription through your local phone company) and stores caller information in the 50 name-and-number memory. Enjoy the benefits of programmable speed dial and one-touch dialing, as well as call transfer, hold, mute, and intercom. 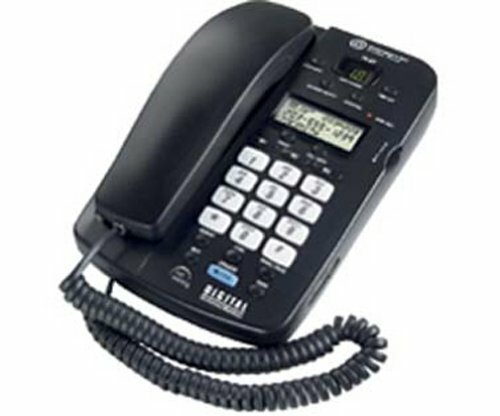 Security features include call restriction and dial lock, and the KX-TS3282W even offers programmable ringer patterns that can be assigned to specific extensions for easy, audible identification. We bought one of these to replace the older model KT3280 which we bought about 10 years ago. We love the built-in caller ID. Haven't tried any other phones as we are pleased with the Panasonic. This phone was listed with LCD features but not suitable for my needs.It was shipped by Beach Audio.Contacted Beach to convey my disappointment and return the telephone.I was required to go through ridiculous red tape procedures plus $10.20 shipping and "required insurance" I purchased this phone on Nov 17, 2003 and returned it on Nov. 23,2003.My visa was originally billed for $94.85including shipping&handling.I paid a total of $105.50.Until I called today there was no credit on my Visa.BeachAudio is allowing me $79.52. This is highway robbery. ATT 972 2-Line Corded Feature Telephone - In this era of cellular and wirelesstelephones, it's a novelty to find a quality corded telephone for home and Personal use. Corded telephones were the dominant form of Telecommunication throughout most of the 20th century. ATT was the dominantforce behind them. The ATT 972 meets contemporary demands for nostalgic oldergenerations and rediscovering younger generations. This product is Demo and comes with a 30 day warranty. This phone worked well, but, in less than 6 months, the speakerphone faded in and out, to the point where it was not possible to hear the incoming message at times.I obtained a replacement, but the replacement phone did the same thing.Other people have reported similar experiences in their reviews. The phone works OK, all features are fine, but when you are using 1 line and someone else uses the other line, you can hear them and they can hear your conversation. I thought that this was something in my house wiring but fond out that this is not the case, (and by the way, I am using 2 different phone companies). Well, if you want something with that price, you expect to have some issues. I would give it 3 star rating. This phone has lots of good features for a good price--when they work! The speakerphone on line 1 works great. You can hear and be heard from several feet away. When I use it on line 2, the speaker fades in and out, often so low you can't hear your party. The headset jack has a short in it, so you have to fiddle like crazy to find a position where the headset doesn't crackle (then if you accidently move the plug you have to start over). It has a cool feature that ends a call when the other person hangs up, saving you from having to hit a button to end the call when you're on speakerphone or headset, but unfortunately it occasionally will end a call BEFORE they hang up--embarrassing! The caller-ID will not let you back up to see a number you've already seen--it's just gone. The voicemail waiting light sometimes doesn't blink when you have voicemail. That's all I can think of right now. 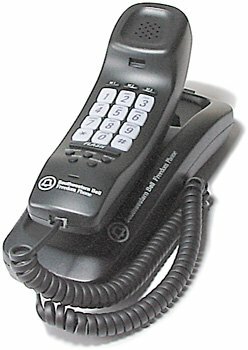 Anyone know of a good quality 2-line speakerphone that will hold up to every-day home-office use? One of the worst phones we've ever owned! We've had nothing but ongoing problems with this phone.The biggest one was the phantom interefence noises that would eminate from the phone in the middle of the night!They'd go away if you jiggled the cord enough and then suddenly come back a month or two later.The hands-free option no longer works and now it's extremely difficult both hearing and being heard on it.And we've barely owned it a year! This simple, practical phone uses AT&T's classic Trimline design to fit snugly into small spaces, yet it contains the modern convenience and sturdiness you expect from AT&T. With subscription to local service, you'll be able to use the 99-station caller ID history to instantly return calls; each incoming call automatically receives a time/date stamp for easy organization. I bought this device to mount on the wall in front of my work desk, and for that purpose it's an admirable phone. Plus: The contrast- adjustable LCD displays current date and time without you having to set it, the buttons for call list browsing, option setting, etc. are on the back of the receiver so you don't have to take the phone off the hook to use them. The sound quality is great of course, this being a corded phone, and it feels somewhat worthy in your hand. The keypad lights up, although only for a few seconds - dial fast in the dark! The ring tone is nice at its medium setting. Minus: I find the base a bit bulky, the LCD has no background light, and when the handset is set to "hi" volume, you do hear a bit of a screeching noise when putting the set down on the base (I keep the setting at "lo" though, which is plenty loud). My main gripe is that the phone doesn't have a voicemail indicator, which would be extremely sweet with my phone company (Vonage). Also, the caller id stuff works with batteries ONLY - at least, they could have put a 6v ac adapter plug on the phone. Still, four stars because the phone does all it says it does. I bought this phone for my elderly father last October.The caller ID screen is larger than alot of cordless phone CIDs and you can adjust the contrast by pushing the "options" button, and choosing between 1-4 in "contrast. "4 is the darkest contrast so that is what we set my father's phone on.The phone is very attractive, and can be either wall mounted or sit on a desk.There is a piece on the bottom of the phone you adjust for either wall or desk placement. Now for the negatives.My father has trouble hearing and he had trouble hearing on this phone at times.After I bought him this phone, I told him I had 30 days to return it, so please check it out to see if he could hear with it.Well, he used it, but I never heard a negative word about it until it was too late to return it.He is now using an old phone of mine that has volume you can turn up very loud and he's happy. Personally, I think this is a very good phone.The only negative I noticed is a light background buzzing noise when you make a call on it.If you need a corded phone with a nice size caller ID screen with big letters and numbers, this is a good phone.It would make a good back-up for someone who prefers cordless phones, but needs a corded phone for those times when electricity is off. This is a good phone, except it has one major flaw which makes it unusable. First off, a minor flaw is that it is hard to pick up the reciever as it is locked in there, I don't like that. Another flaw is that while you are picking up and putting back the phone, it makes a VERY high and LOUD screaming pitch. This makes it almost deafening for someone on another phone in the house. This phone will be going back ASAP because it is unusable. Stay away from this phone at all costs. 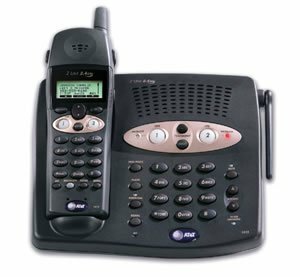 I purchased this phone system in 2001.I really liked all the features and how nicely the whole package was put together.Sony really knows how to design consumer products. BUT DON'T BUY THIS PHONE!6 months after I purchased it the cordless handsets starting having problems with the keypads.I purchased the system and 2 additional phones.That's a total of 4 cordless phones.Every single phone, without exception developed problems with the keypad.At first the numbers are hard to press, then over time certain numbers on the keypad stop working all together.If this only happened to one of the cordless phones I would have written it off to a bad one in the bunch.But EVERY cordless phone developed the problem. Don't even get me started on the Sony's support crappy support.I gave up and purchased aonther phone system. Up until I purchased this phone system I had been extremely happy with my Sony purchases.This has definately soured me.I'll think twice about buying any Sony product.Last thing I want is to have to deal with some guy in India who doesn't understand me next time I have a problem. I have owned this phone since August 2001 and it has worked on both standard (Verizon) and VoIP (Vonage) networks without any problems at all. In general I like Sony equipment and this phone has not disappointed. Talk-time is, with a fresh battery, around 2 hours and stand-by time around 24 hours, give or take. 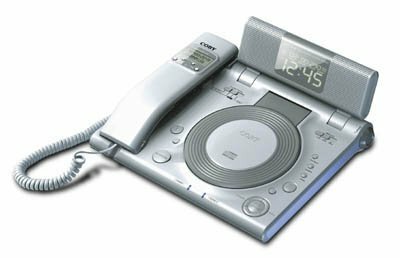 I particularly like the speakerphone (base unit only) and the answering machine (base unit only but accessible via handsets), both are easy to use. The 2.4 GHz handset has never let me down, quality always good. To be fair, we live in a 1 br. apartment so dropout has never been an issue. Even so, neither 802.11 nor microwave ovens have posed a hassle to the quality of calls made via the handset. All in all, I think this is a great phone, it's lasted me three years now and it's still going strong. It gets a LOT of use, I can't think of too many electronics products nowadays that last more than 12 months, in this regard the Sony phone is a standout. Also, to the other reviewer who was looking for a replacement battery (my original battery died after about 18 months) for the handset, I got one from Radio Shack for about $12.95 in about a week, not a problem. Even better, it is a 1000 mAh battery as opposed to the feeble 700 mAh one that came with the phone, so talk-time is longer. 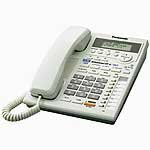 Southwestern Bell's FM2575 with caller ID and answering system is a classic corded phone with plenty of contemporary features. 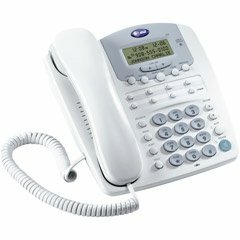 Sleek design combines with speakerphone and a 10-number speed dial, programmable to hold your most important and frequently dialed numbers. Use the flash button to get an instant dial tone (supports call waiting, an optional service from your phone company), and redial lets you keep trying the last number you dialed. A lighted keypad makes dialing at night easier. 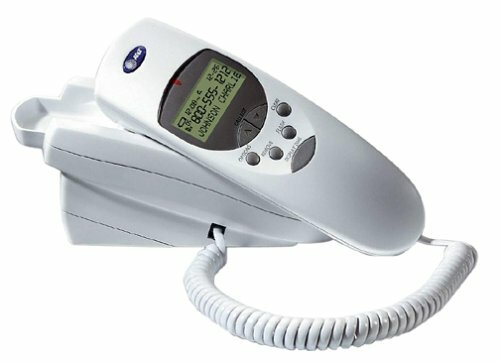 The FM2575 keeps track of up to 64 names and numbers in the caller ID memory, and a large LCD shows callers' names and numbers for easy redialing. After using this phone for a month, I've finally had it and ordered a new phone to replace this one.The quality of the phone is good, the buttons are large, lighted and easy to see. One minor problem is that people have to call twice to leave a message because they get cut off by the answering machine.The straw that broke the camel's back is the maddening voice prompts.Intially, they are helpful - they guide you through setting up the phone and using the answering machine, but...THEY CAN'T BE TURNED OFF ! You can't erase a message untill you listen to the phone telling you how to erase it.I called the toll free # to ask if it could be turned off and the polite person on the other end said "no it can't".I told her it gets in the way and is annoying, she told me that older people really appreciate it. If you can remember how to work your phone - don't buy this one, it will drive you crazy! this phone is.. fine. The big complaint is the digital answering part. My voice sounds like a crazy robot on playback, and when people leave messages they are all kind of shrill sounding (or maybe that's just my friends). The volume for the answering playback on my phone seems to be a bit touchy as well. It seems to go from quiet to loud with nothing in between. we don't use the caller id features, so I can't really comment about that. This is the best phone I have ever owned, hands-down, based on my lifestyle. My job requires me to work on-call, which means there are many times I work nights and sleep during the day. The features on this phone are perfect for someone with an unpredictable schedule who works on call. On top of the phone, there is a switch to turn the ringer loud/soft/on/off - EXCELLENT FEATURE being able to turn the ringer COMPLETELY off (many other phones merely allow you to turn it LOW which is still audible and an annoyance). On the side of the phone is a sliding volume switch for the answering machine - another great feature when you do not want to hear messages or are sleeping. There is a switch on top that can be adjusted to 2 or 4 rings or can be set up for the fax to pick up (if you have a fax). Recording a greeting is easy and retrieving messages is easy. Deleting messages is a breeze. Don't feel like listening to the message, no need to listen to the whole thing, just hit "DELETE." Don't want to listen to the computer voice, hit "STOP," a couple of times. Finally, the phone is CORDED! (It comes with a 4 foot cord, but I bought a 20 foot extension cord for the phone.) If you live with someone who never puts the cordless phone back in the charger, this phone is a "must-have!" Also, if the power goes out, cordless phones usually do not work. THIS MAY NOT BE THE PHONE FOR EVERYONE! If you want a phone that allows you to remotely access messages, this is not the phone for you. For whatever the reason, if you require a phone with the capacity for someone to leave you a longwinded message in excess of one minute, this is not the phone for you. Messages are not always crystal-clear, but they are audible. If you write for a gossip column or run numbers, buy another phone. If you're just a guy who wants peace and quiet and a reliable phone, this is your phone. Don't forget to put in the 9-volt battery - the phone still works in a power outage, but you may lose your messages and greeting if you don't put in the back-up battery. What do you expect for a phone under $40? The only other phones with ALL the features this phone has - (1) corded, (2) on/off ringer switch, (3) caller ID, (4) built-in answering machine, (5) sliding switch to turn down the answering machine - are usually at least double the price (over $90) of this phone and/or require you to program the features. I like the simplicity of this phone and the fact that I do not have to open the user's manual every time I use it. Very bad product as others have said.We've had this phone for over a year and it's been nothing but problems.Poor phone quality, frustrating anwsering machine, not able to use remote access feature.Now it has a really loud background hum.Final straw.We will replace shortly. We've had this for a couple of months, and so far it's done exactly what it needs to do.Only two things about it are less than perfect: 1) it's hard to see the caller information in low light, and 2) if there are new calls, a little red light continues to blink until you clear them all out.Overall, though, it's doing exactly what we bought it to do, and is a good value for the price. The unit does not work with DSL.It displays Caller ID information when you are on the line with another caller, but does not display any Caller ID information when you are not on the line. When I called GE customer service about this problem, they informed me that the unit does not work with DSL. This box is much better than the GE 29016S one I had previously. The return-call feature is nice, and this unit even has a stand underneath in case you need to view it at a higher angle. This phone is great quality for the price range, although the sound quality is a little less than my older similar model, the 29418 (which didn't have caller ID or LCD display). I bought this model for the Caller ID, and because I liked the old 29418 a lot.This phone, the 29481, is slightly smaller, similar in quality, but has more electronic controls rather than analog.This is particularly noticeable in the volume control.The older phone had sliders for volume which worked great.Changing volume on this phone is done with a single push button.Each push raises the volume 1 notch, until the max. volume, and then it starts back down.So it can be a pain (requiring up to 14 presses to lower the volume one notch for example). One major problem is lack of call waiting caller ID.I rely on this with my cordless - if I hear call waiting, I check who it is before switching over.On this phone, you don't get call waiting caller ID so you have to click over and answer the call to find out who is on call waiting. My last complaint is that the buttons are smaller on this model, and it can be a pain to hit the right one.The speakerphone button especially, as it has a tiny redial on one side and flash on the other. In response to a previous review, the line 1/2 buttons are the same as my old model, which held up just fine for 2 years with a lot of use.In fact, I think they have a solid THUNK to them which seems like it will last a long time. If you are looking for a decent quality 2-line speakerphone with caller ID for under $100, this is the best pick I found after 10 hours online. A bit disappointing -- the "Line 1" and "Line 2" switches feel flimsy and likely to break; you really have to click them in to get a dial tone rather than press softly.The speakerphone function works like a 2 way radio, i.e. you can't talk and listen at the same time.If you plan to use this phone as a business phone, forget it; it's a toy.The speakerphone is useful only for listening purposes, and switching between lines causes a quick burst of static, at least on my model.For the price I suppose it's OK, but if you need a work-horse phone with durability and a useful speakerphone, this isn't it. I tried five different corded telephones before I finally came across this GE 2 Line/Caller ID Phone. All the others had terrible audio feedback problems and I literally could not stand the sound when using them . I like all the features of this phone, especially the great display and the automatic saving of phone numbers from your received calls. It's very easy to just save them into your directory.If only the sound quality were better. We've had it 2 years, and now there is static on the line and the speakerphone fades in and out. I bought this phone a year ago to replace another aging AT&T speaker phone for home use (speaker phone is a must if you do a lot of phone conference, or talk to customer service which will put you on hold for half an hour). Overall I am satisfied with the phone's quality, function and relability. The phone is retively easy to setup, even without manuals. All plugs and holes can be easily matched. It needs a power adapter for the LCD display and speaker phone to work, but if electricity is out, the phone still works, just without these functions. It is a good design decision (but I hope speaker phone could still work since my previous AT&T phone does that). It has four illuminate indicators (new call, line status, mute, speaker). They provide good feedback and I like them very much. Every button you press will generate a beep which is also a good indicator of what you are doing. Good design. Caller id function works reasonably well. Dial back is a breeze. It even append "1" ahead of area code if caller id phone number does not have that. It is a breeze calling back. Phone quality is very good as you can expect from a land phone. It is loud too so you complain about not hearing clearly. There is a phone jack outlet which could be used for modem connection (you don't need to plug your modem in another phone jack). 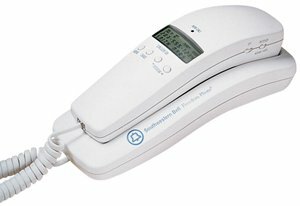 You just use a short phone line from this phone to your computer. This is convenient if you use a computer modem on the same desktop. Reliability? Have used this for roughly a year and no problem so far. The very reason I bought this one is my previous AT&T speaker phone is very reliable - I bought that one second hand and used that for another 5 years. It does have some shortcomings though. One thing I found the handset feels too light and sometime I wonder if I place the handset correctly in the base. Another thing is the LCD screen may be tilted more toward user - currently if your desk is high or you don't sit high, the screen may be too flat to view clearly. We were satisfied with this phone for 14 months. Then one day we came home and there was a static sound coming out of the speaker. It got gradually louder and then went silent. The loud beep when pressing keys is gone as well as the speakerphone and the caller ID. Unfortunately, it was covered by a 1 year warranty. Now we have to find a replacement. This is a great Phone at a Great Price...Period! Why people have rated this phone somewhat low is beyond me! Usually I won't endorse anything without the big check in hand but I found myself impelled to tell you about this phone! Great! Took under 3 minutes to program and have completly set up! Has redial, flash for two lines, hold, mute, volume control not just for the outstandingly clear speakerphone but also the pleasent ringer! I don't know about you but I cringe if the ringer sounds loud and shrill especially after a long night pleasing the masses! I hear enough loud noises on stage! This phone is like from....heaven! Date, Time you name it it's got it and under $25.00? Come on...would I lie to you or waste both our time? Get this you won't go wrong belive me..It's a 5 star phone! I was very disappointed in this phone because it only lasted 4 months before it started making loud noises during conversations.I was surprised that Southwestern Bell would tolerate such defects in their workmanship. Invest in a magnifying glass! 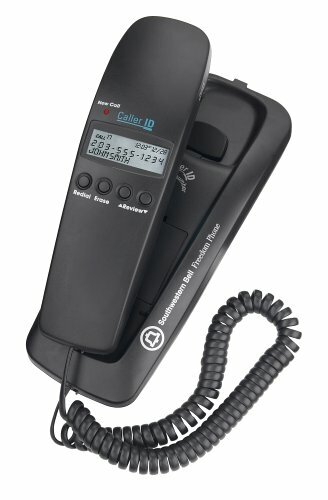 I have had the freedom phone trimline fm2552 for over a year now and i still have to turn it a certain angle towards the lighting in my home to see my incoming calls on the caller-id.By the time i figure out who has called, they have hung-up! Other than that feature, it works alright. The price is reasonable and it works. I got this becauses my old phone got rained on. I live in a college dorm - I hardly ever use the phone except to order food. It works fine for that; I'm happy. I bought this Southwestern Bell caller ID phone solely because I wanted something inexpensive and small for my desk.What a mistake!Every time I get a call, I have to lift the entire unit close to my face to see the caller ID. Sometimes when I pick up the handset to make a call, I don't get a dial tone until I click on the cut-off button. It looks nice, but feels cheap.Even for the slight cost, this phone is not worth the money.Although it stores a sizeable list of incoming calls, erasing the list takes a fair amount of time if you've built up more than a few calls. The corded design of this classic phone may look old-fashioned, but you'll be glad to have it on hand in the event of a power outage. You can place the base on a convenient surface or easily mount it on the wall, saving on counter space. A 50-number phone book lets you store your most frequently called numbers, and the 20-number redial allows you to easily resume interrupted conversations. With subscription to local service, the three-line LCD screen lets you know the name and number of callers--and stores up to 50 calls in its memory, that you can return at the touch of a button. The phone and keypad are black. The KX-TSC11B comes with a one-year warranty covering parts and service. I had a simpler AT&T wireless phone.The phone was good, but the battery started not holding a charge long and it was cheaper to buy another phone than replace the battery, so I went phone looking.This one is really a great one, with a lot of features that you generally see in phones that cost twice this. What I really like about it:Two lines.Each lines are clearly displayed with their own settings.You can control the ringer on the be base and the phone itself.You can have the base ring - or not - as each line has its own high, medium and off switch.Have one right and not the other.Turn both off.The same option with the handset.Each line can ring on the handset or not.Have 1 ring and 2 off.This is handy for Fax set ups. The programing is simple.You want a distinct ring for each line, then you click it that line, punch 1,2,3,4 on the number pad and it will change the tone.Click select and you are ready.This is handy with two lines - you can have a separate ring for each.The button for each is clearly set on the handset.1 and 2 buttons that are dial tone buttons.The volume for the handset it on the side.You don't have to change that in menu like I've always done on other wireless.So you can change this in the middle of the call without peeping in the callers ear! It has mute controls for the base and the handset - for both lines again.Speaker-phone on the base.So if the handset is left at the other end of the house you can still take calls from the base.Hold, line-in-use indicator, a data port, intercom, pager, base-dialling and 2.4 GHz make this one sound like the caller is in the other room.50 name in directory.The handset it nice and "solid".Read out for caller ID easy to read for this baby boomer. So for the price you really cannot beat this one! There may be better cordless phones but this had the right combo of required features that were hard to match in other products - it supports 2 lines, caller ID, has an alert light for phone company voicemail, had a keypad on both the base and the handset, speakerphone, etc.Also, it uses 2.4Ghz channel 1 and to date it hasn't conflicted with my two 802.11 Wi-Fi network access points running on channels 6 and 11. The main annoyance so far is a loud clicking sound on the handset earpiece when a call comes in on the other line, even with the alternate line ringer turned off. If you get freequent calls on a secondary line that might be a consideration. I spend around 90 bucks for this phone at staples for my small home based business. At first it seems to have a lot of neat features but falls short when it comes to call quality. I have friends with $15 v-tech phones that sound better than this! There is static on the line and the tones for the buttons are so loud they'll blow your eardrums out while the voice tones stay too quite to hear. They are both on the same speaker so you can't adjust them independently. I suggest AT&T go back to the drawing board on this one. If I was going to spend $70-$90 on a phone again I would definately not buy this one. I think I will have to resort to buying a much more expensive phone to get the quality needed for a business phone although I've heard that even at $500 there's a lack of call quality. I may be switching to a VOIP system anyway so maybe I'll have better luck in that market. thisphone is hard to place on the wall and falls off easy.I cannot clear themessages . Howeverthe id does work.also you have todialslowly. the cord should belonger too. Useless in dim light situations.No backlight on display.Font is tiny. After setting up this phone I used it to make a few calls.I immediately noticed a lot of backround noise whenever I used it.The noise was there whether making or receiving calls.When I switched back to my old phone on the same jack, the noise was gone.I'll be returning this one.